Our lawns and gardens are put under a good deal of stress as the weather warms. Any weakness in water coverage, soil nutrition or weed control shows up immediately in the heat of summer. Preparing ahead of time is a good idea. Now is an excellent time to double-check your sprinkler system. Plugged or broken heads should be fixed or replaced. Brown-patterned circles in your lawn around a sprinkler head indicate it has been plugged by dirt or has become a victim of the dreaded lawn mower attack. For sprinkler heads that are simply out of alignment, use a flat head screwdriver to adjust your sprinkler head back to it’s correct spraying angle. 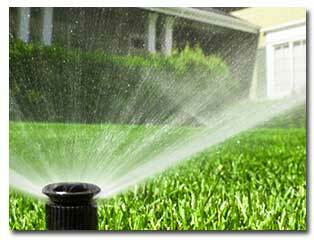 Simply turn on your sprinklers, station at at time, and be sure that all lawn surfaces are being covered with water. Use the small, flat head screwdriver to adjust. The irrigation system in flower beds should also be carefully checked. Many times we plant in front of a sprinkler. This isn’t a problem when the plant is a 6″ tall seedling, but can result in disaster for others in the bed as that tiny plant grows to a couple of feet in height and blocks the water to other plants. Make the necessary adjustments and watch your plants flourish!